Over indulging on Thanksgiving is not just a problem for you. Your cat can eat too much or even be poisoned by your favorite foods. “For a small cat, one ounce of cheese is nearly the equivalent of a person eating two Big Macs,” according to the professionals at Newtown Veterinary Specialists of Newtown, Connecticut, who posted some sensible suggestions about what you can and can’t feed your pet on Thanksgiving. Your cats are part of your family. And not all of them are picky eaters. 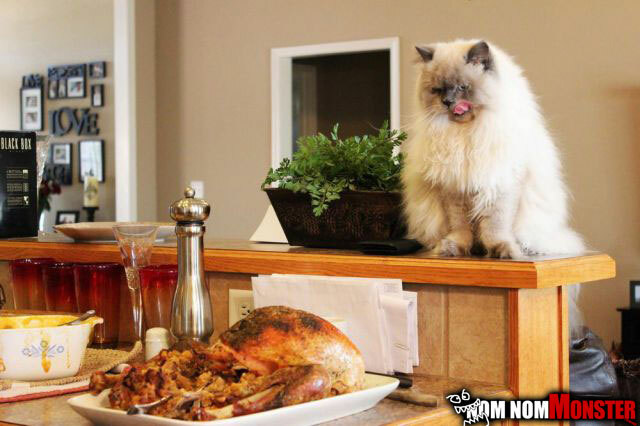 Keep the holiday safe and avoid feeding your kitty foods that are toxic or could cause vomiting or diarrhea. 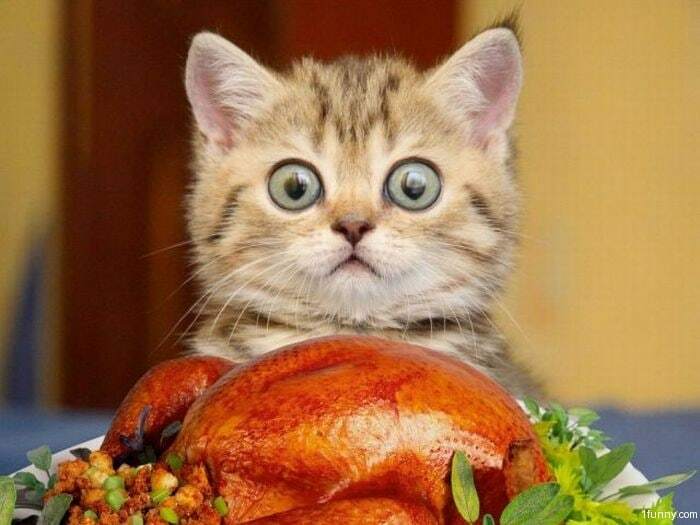 Some cats are even allergic to turkey! Onions, chives and leaks can poison your cat, according to the ASPCA, which has issued a list of holiday dos and don’ts. Bread dough and batters may contain raw eggs that could be contaminated with deadly salmonella bacteria. Be sure to cool off any hot foods that might burn your cat’s mouth or esophagus. Break everything into small, bite sized pieces. Turkey is fine if it is fully cooked. White meat is best. Don’t feed your cat any of the crispy skin from your holiday bird. It’s too greasy and could be flavored with onions and other toxic ingredients. Never give a cat or dog anything on a toothpick or skewer, vets advise, since both constitute a hazard if swallowed. In general, foods that are new and unfamiliar can induce vomitting or diarrhea. Let your guests know your cats have been fed and that it’s not a good idea to feed them on the sly. Vegetables should be always be cooked. Non-toxic vegetables include broccoli, green beans, sweet potatoes, and carrots. Finally, the ASPCA says never let your let your cats scavenge food from the trash if you don’t want them to get sick. Werewolf Cats: Do We Need Another Exotic Breed?